Brían Francis O'Byrne (born 16 May 1967) is an Irish actor who works mostly in the United States. He was born in Mullagh, County Cavan. O'Byrne first attracted notice for his performances in the Martin McDonagh plays The Beauty Queen of Leenane (1996) as Pato Dooley (for which he received a Tony Award nomination for Best Featured Actor in a Play) and The Lonesome West (1997). He is known for taking on serious and dramatic roles, such as a serial killer in Frozen (1998) (for which he won a Tony Award) and a priest accused of child molestation in Doubt (2004), for which he received a Tony nomination. O'Byrne also appeared as a priest in the 2004 film Million Dollar Baby. 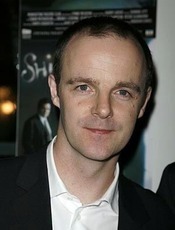 In May 2007, O'Byrne was nominated for a Tony Award for his performance as Alexander Herzen in Tom Stoppard's 2002 trilogy The Coast of Utopia. In 2011, he was nominated for the Primetime Emmy Award for Outstanding Supporting Actor in a Miniseries or a Movie for his performance in Mildred Pierce as Bert Pierce.